Slotracing is a high level technical hobby. 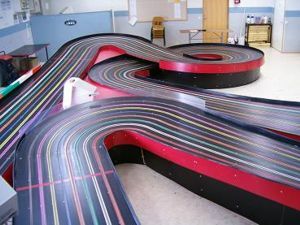 Slotracing as we see it is based in same functional principal as those track sets that are sold for home use. 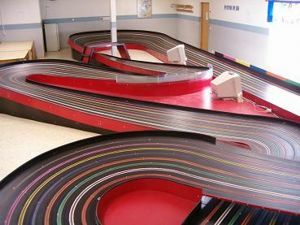 But the facts that cars are controlled by adjusting the speed and that track has slots are the only common things between our hobby and those home tracks. As You can see from the photos our cars, tracks and even the hand controllers looks completely different than anything else. Cars are designed and made for one purpose only: to drive as many laps in race time as possible! Rules are very free. Basically only dimensions. "Only a few specialists are using these "rockets" as a drug. But if you know, how it works, you will never leave it." Cars have aluminium chassis, very effective motor, ultra aerodynamic and lightweight body and very special tyres. Cars are always build by the racers. So building and tuning these cars is one major part of the hobby, and necessary key to success. 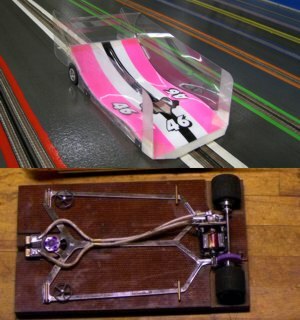 For example chassis shown in these pictures is 3D Cad designed by HYPE slotracing. After design was ready we examined different types of aluminium and the chassis was cut with EDM. After that the coating is done buy a special way developed by Hype slotracing together with the top coating company in Finland. So we think that slotracing, as we see it, is a very high level technical hobby. Tracks are specially made large wooden tracks. Building and preparing a good race track is not an easy task to do. In the world is only like 3 specialist who are capable of building a good track. And after the track is build, starts the even more important part of the project: finalizing. Finalizing is long lasting project which includes everything from painting to final tuning of different sections of the track. So unfortunately this has ended in situation where only few clubs in Europe, US and in Brazil are capable to have a really good track. Controlling these high speed cars is tough job. For making it as exact as possible all racers have developed their own special equipments for adjusting the speeds of their cars in every track conditions. Racers whole set of equipment: ??? 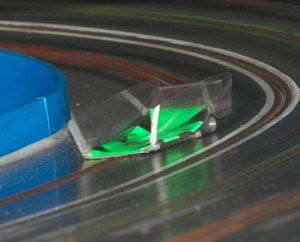 Under name "slotracing" can be found very wide selection of different type of racing with miniature cars. Common thing for these is that cars are driven on a track with slots to guide the car. 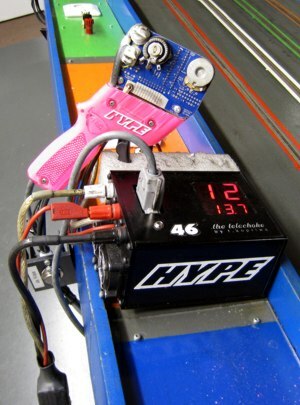 But as You can understand HYPE slotracing concentrates only in the ultimate top of slotracing.